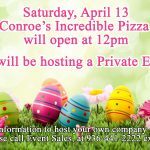 Private Event until Noon - Incredible Pizza Company - Enjoy our huge all-you-can-eat buffet, indoor Go-Kart Races, Bumper Cars, Route 66 Mini Golf, a huge video game arcade with prizes, Bowling, and more! We will open at 12 p.m. on Sat., April 13, due to a private event scheduled. For information on reserving your own private event, call 936-441-2222.